#55 PR – ‘And The Power of Positivity’ – Mindfump! Back in 2011 the then Chancellor of the British Government, George Osborne, was in a tight spot. He was in charge of a flailing economy whilst cutting public spending dramatically. His back was against a wall, the wolves were closing in, what could he do? He unleashed the power of PR. In his predictions for the UK economy he said the U.K. Should expect ‘negative growth’. Genius, negative growth. 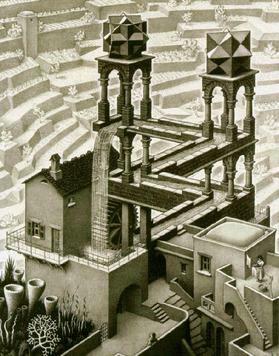 It is the literary equivalent of an M.C Escher drawing, only significantly more devious. Politicians, skewing the truth? Say it ain’t so Mindfump. I know, I find it hard to believe as well. But today I am taking back ‘negative growth’ and repurposing it, like an upcycling crowd funded non-profit homeless shelter. I’m George Osborne desperate today, desperate to find the positives. Where are they? And how can I spin this? How can I convince myself there is hope and positivity out there. Mr Osborne might just have been on to something – but in all the wrong ways. See, I’m progressing in my life, I have writing aims and blogging goals. I have geographical goals and romantic aims. I even want to win the Champions League with Hartlepool United first try on FIFA 12*. And if I step back and squint a little I am actually progressing in all departments. Today was an awful day, I have been exceptionally down. It took me forever to get up, I spent all day feeling fatigued, I’ve had a total lack of self care and hygiene, zero motivation and/or optimism and I’ve avoided social contact at all costs. But – I am negatively growing. Although today was definitely very negative, on the whole I am actually edging closer to my goals, to my aims. Slowly but surely getting there and that is where the growth is, that is where the positivity is. That is why I’m negatively growing. Now obviously I hope tomorrow I’ll be positively growing but considering how bad today is, I’ll settle for negative growth. I’ll also settle for a 4-0 victory for Hartlepool given we were beaten 3-1 by Marseille in the first leg last 16 tie. *I’m a little behind the cool kids. Sorry to hear you are so low today. We get days like that with our illness and our mood does come round again. Doesn’t help while you’re going through it though. Remember, it’s okay to not be okay and be kind to yourself. You are a star sir. These things come and go, you’re right. I’d be happy for this to go rather quickly now. Good post, my friend, in spite of an awful day for you. Your wisdom is always welcome, as are your kind words. Thank you Buffy. A bad day, but a great post. The bad day didn’t stop that. That’s a result worthy of taking Mindfump and Hartlepool right to the top of the table. haha, I have way more confidence in my FIFA hartlepool team than I do in myself… but they are really something special. Thanks for your kind words once again. Sorry you had a bad day today. I had one yesterday. All in my own little world and not talking to anyone about it. Today I am tired but more positive. I am back on Facebook and blogging again. So this is all positive. The bad days though tire me out. Hopefully tomorrow will be a positive day or a stand still day…just not negative! Take care. Sending digital, salted caramel donuts! 😀 Much needed – thank you! #57 Creativity – ‘And The Volcano Principle’ – Mindfump. #58 Lego – ‘Tentative Steps Out Of Depression’ – Mindfump.